From an intersting site: Marketing Routes, a useful link with a collection of Web 2.0 tools and sites. Hope will be useful for all of you. As Apple user, usually I hate Microsoft, but the new product Microsoft present yesterday appear that will be very useful to use in museum environment. There is an article presenting it, here and here, but all the web is full with information about Microsoft Surface. Microsoft Surface is a 30-inch table-like display where to apply surface and gestural 3D interface. It is more difficult to explain in text then you can see in action. Europeana it is a prototype of on-line library, with more than 12.000 documents. It is the Francaise contribute to the European Digital Library. The European Library is for searching the content of European national libraries. An intersting project for interactive application inside a museum, The TANGIBLE Table. A 100×70cm interactive table to use as interactive user interface. Here more info on the project. Photo Agency of the Réunion des Musées nationaux de France is putting together a veritable archival treasure. You need only a word, a title or an author to initiate a search that will always reward you. This Oracle-based site gives access to all national museums. The list is a long one including the Musée du Louvre, d’Orsay, Pompidou, Guimet, Picasso, de l’Orangerie, le Musée Rodin or Delacroix, the Bibliothèque de l’Institut, as well as the Chantilly, Compiègne, Écouen, les Granges de Port-Royal, Fontainebleau, Ajaccio, Nice, Matisse, Message biblique de Chagall, Les Eyzies-de-Tayac and the Musée de Préhistoire. From the site, you can access many other groupings via the Joconde database that classifies and lists under one of its many headings all the tables possible according to a variety of criteria: alphabetical, administrative document, iconology, lyric poetry, almanac, drama, images, proverbs, past records, eloquence, word games, psalms, biographies, sagas, etc. Since 1999, an effective query function on the photo.rmn site has been supported by the Auracom search engine, created by a French company founded by Michel Martinez. The Drawings and Manuscripts of Leonardo are now on-line thanks to Biblioteca Leonardiana and e-Leo Project. On “Leonardo Digitale” there are the Atlantic Code and the Madrid I and II Codes. Dear museums bloggers, Jim Spadaccini propose to meet blogger at Museums and The Web conference in San Francisco. This will be a fantastic occasion, I’m very sad that I can’t be there, but another occasion will be AAM Conference in Chicago, in May and I will be there. From AAM Boston, last year, I start the tentative to put together museums blogger with the first list of museums blogs in my blog, this goal was completed by Jim (Jim did you present a paper in Chicago?). Consider that Museums and the Web is an event more oriented to colleagues inside IT sector, AAM conference is an event more generalist, where there are more people involved and more colleagues that need to be aware about museum blogs. So Chicago will be a good occasion to make more people aware. There are also example of PDF regarding museums. It will be useful for museums to put PDFs in iTunes. Apple just announce the iPhone, it is an iPod, a Cell Phone, an Internet Navigator, just in one device. It will be the revolution to use this device in a museum like a video/photo/audio guide. Directly on the Apple web site to have more info. an intersting blog, Open Culture, post a news about New York Times podcasts “America’s finest daily paper now offers a series of 22 podcasts on iTunes, which come in daily and weekly flavors. Most are direct spin-offs of popular sections/features of the paper”. 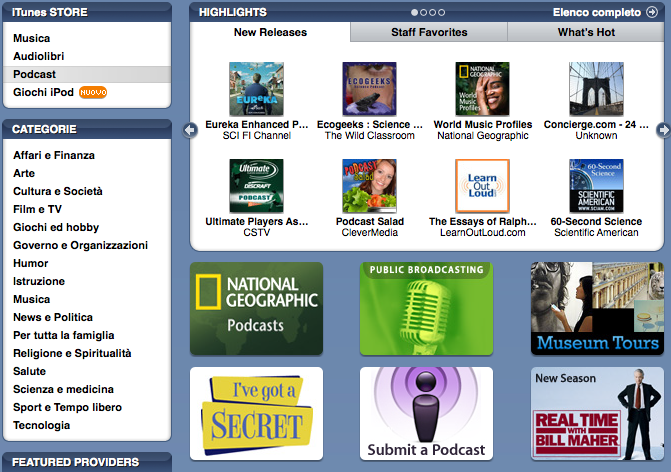 Open Culture also have a complte list of cultural podcasts on this page. 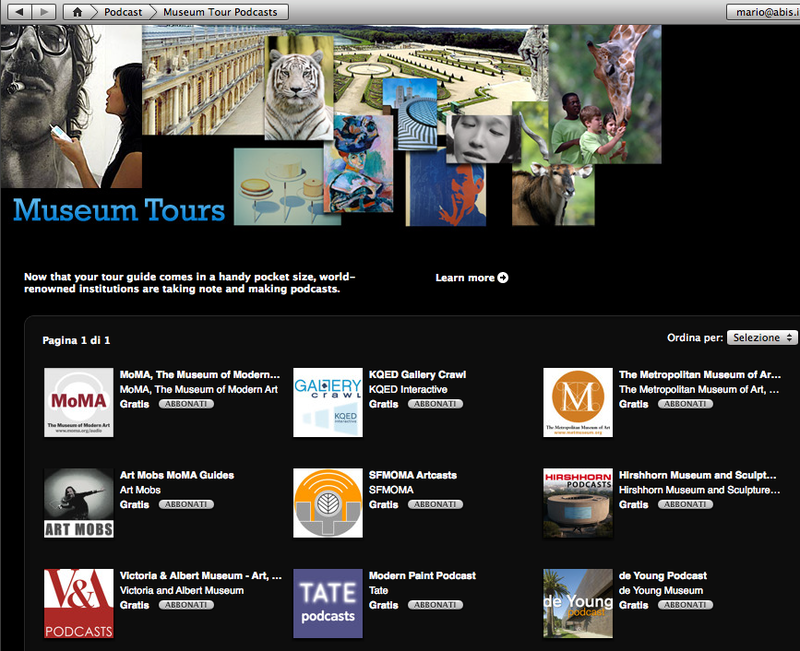 As hoped, Apple introduce a page in iTunes Store dedicated to podcast from Museums. Hi colleagues, who use Skype need to know that today and any tusday in august, Skype offer 20minutes of free calls. Go to Skype home page to redeem minutes. You are currently browsing the archives for the Hi-tech category.